Morning thunderstorms have mostly weakened now, except south of the border. Large area of residual showers and heavy cloud cover is drifting slowly westward across Cochise County, and a small area of showers in eastern Pima County is moving west along I-10. There are large areas of cloudiness this morning over New Mexico, southeastern Arizona, and northern Sonora. It is likely that there are MCVs/weak inverted troughs associated with the debris systems east and south of Tucson area. There is also a larger, but weak trough south of the Four Corners region - net result will be a complex and somewhat chaotic large-scale setting today. The morning skewT plot of the 12 UTC TWC upper-air data (above from SPC) shows another onion shaped sounding - but importantly, one that requires minimal heating to produce a deep boundary layer that will have moderate CAPE. The vertical wind profile remains very poor with chopped-up, light winds below 300 mb. Storms at low elevations will evolve depending upon the amount of local heating - looks like best sunshine will develop just to west of heavy clouds moving west from Cochise County - and the evolution of outflows. It will be another day for careful monitoring of the hour-to-hour evolution of storm activity, especially since possibility of downbursts and heavy rains will be significant with strong thunderstorm cores. Finally, the NHC has upgraded TS Guillermo to a Cat. 1 hurricane this morning (IR image of storm below is from 1330 UTC). 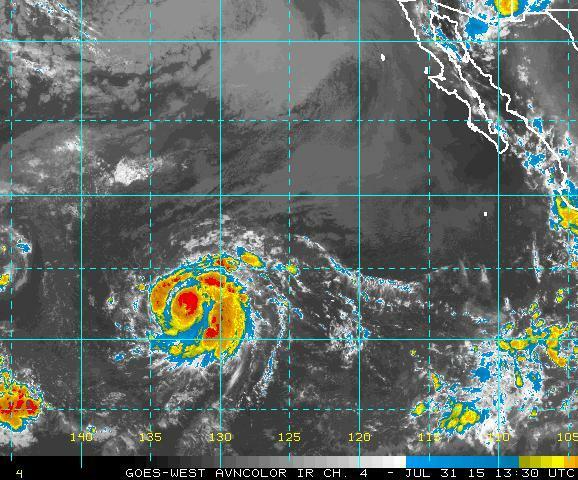 Guillermo is west of 130 W and moving off toward the Big Island of Hawaii - so not of much interest to us in the Southwest. As models were suggesting yesterday there are early morning showers and thunderstorms over parts of northern Mexico and southeastern Arizona. 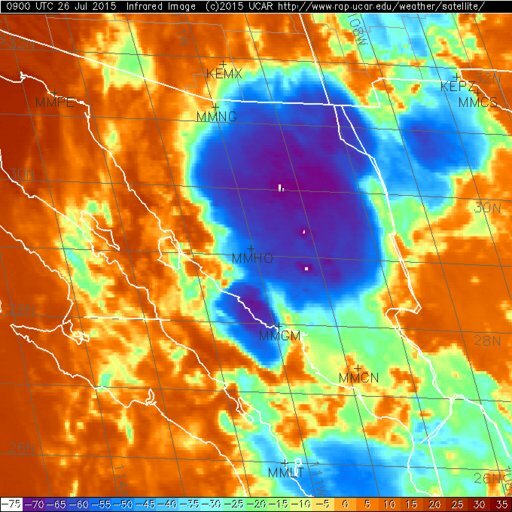 The IR satellite image above shows debris cloud over much of Pima County from a decaying MCS in Mexico. There may be a few sprinkles from this debris cloud and south winds have pushed PW back up over 1.60 inches (as per GPS estimates on campus). The MCS over the Chirichuas off to the East remains active, as per the 5:00 am composite radar chart below. The two WRF graphicss here illustrate composite radar forecasts from the 06 UTC runs - both runs have forecasted some of the early morning situation quite well, while being considerably off wrt other details of the situation. The forecasts are both valid at 5:00 am, the time of the radar chart above. Which version (WRF-NAM above and WRF-GFS below) of the forecast is "best"? That certainly depends upon where the evaluator is located - the NAM version looks pretty good if you're in Tucson or Nogales, while the GFS version looks very good if you're out east in Portal or Paradise. Regardless, with MCS debris and residual circulations across southeast Arizona at sunrise, the forecast for rest of the day may prove challenging. Small gallery here of photos taken Tuesday and Wednesday this week. The top three are from Tuesday the 28th. Photo above is from Mike Olbinski - http://www.mikeolbinski.com - he took this about 4:30 pm MST from along I-10 northwest of Marana looking toward south-southwest. Zoomed version below focuses on nebulous feature at left center above. 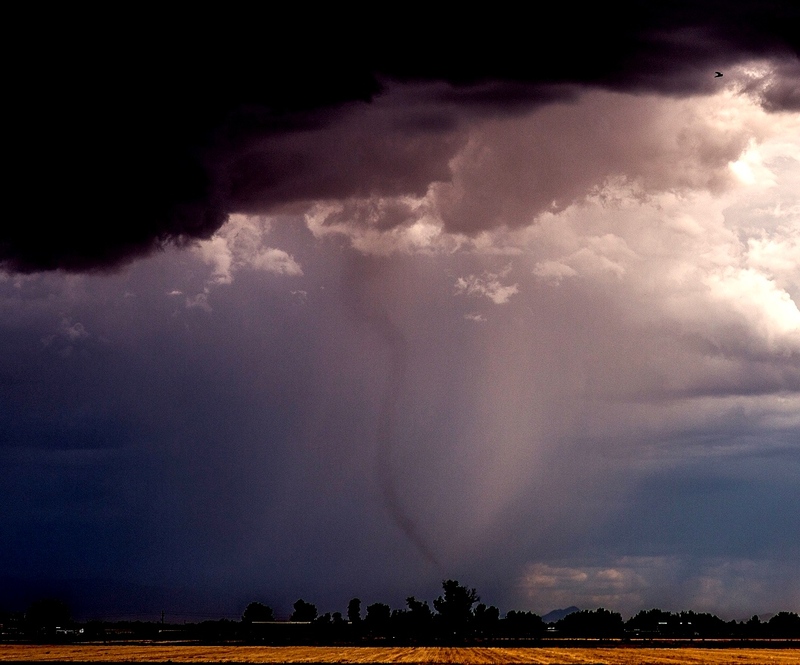 It appears that there is a landspout-type tornado lurking behind the rain shaft that is partially obscuring it. Photo below was also taken on Tuesday from house, looking north at about 5:45 pm. The ragged, funnel-like feature appeared to be rotating slowly. Remaining photos are from yesterday, the 29th. Above is from Ron Holle in Oro Valley, looking northeastward around 6:40 pm MST. Updraft base appears to have some rotation. This photo of an unusual wedge of sunlight, with partial rainbow, was taken by Jim Parks - view is to the east at about 7:00 pm from near Campbell, south of Prince. 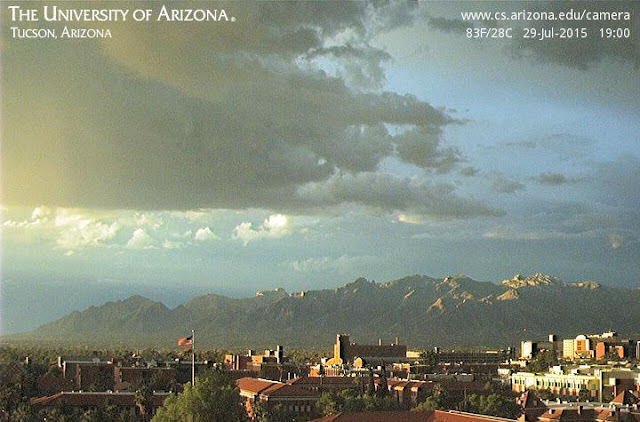 Finally, two views from the campus webcam looking north toward the Catalinas - top is from 6:00 pm and bottom at 7:00 pm (also catching the unusual lighting). Note the flag, which shows that strong gust front had passed across campus from the east between the two images. 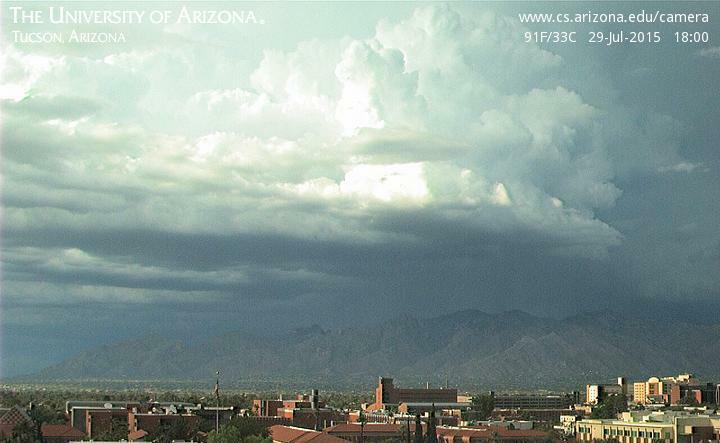 Thunderstorms yesterday stayed mostly on the high terrain around and north-to-east-to-south of Tucson. Several storms tried to come off the Rincons into lower terrain but slowly weakened before they got very far. The plot above of detected CG flashes though 11 pm MST last night (above from Vaisala and Atmo) shows this clearly. Several rumbles of thunder here during late afternoon but only some brief spits of rain. Across the ALERT network 71 of 92 sites had measurable rainfall for the 18-hour period ending at 6:00 am this morning. Amounts were heaviest over the eastern part of the network from the Catalinas around to the Santa Ritas and generally very light over the lower elevations of the network. Debris cloud rain produced 0.07" here at house after dark. Precipitable water has been decreasing during the night (time series above is from on campus), with values falling to about 1.25 inches this morning, down almost half an inch according to the GPS estimates (only minus a quarter of an inch from the 00z sounding to this morning's). The TWC skewT plot for 12 UTC this morning (below, from SPC) indicates much reduced CAPE, with almost none likely at low elevations this afternoon (models do bring PW up some from the southwest later today). Winds are mostly light except in the upper troposphere. Not a very good start to the day, and the WRF model runs from 00 and 06 UTC forecast only isolated mountain storms for this afternoon. Most interesting thing I noticed looking at the model forecasts was that both the NAM and GFS versions from 00 UTC forecast showers before sunrise over eastern Pima County tomorrow morning. Light showers continue this morning (composite radar above is for 7:15 am MST), with most echoes to the west and south of Tucson, moving toward the northwest. Heavy clouds cover much of Arizona, New Mexico, and northern Mexico this morning (visible satellite image below is from 7:00 am), meaning much reduced heating today is likely today. The morning skewT plot of the TWC upper-air data (below, for 12 UTC from SPC) presents another onion shaped sounding, with cool, worked-over air below 800 or so mb. Winds aloft have increased from the south-southeast above 700 mb, providing a bit more steering flow for today. The directional shear profile remains fairly poor, but anvil shading may not be very important today, given stable low-levels and significant clouds. Typically, this would be a totally down day, however, the situation is a bit more complicated today. While the low-levels have been stabilized, a couple of layers aloft from 800 to 600 mb have considerable CAPE, if lifted a bit, thus elevated showers and thunderstorms are possible, if this situation continues through the day. Yesterday afternoon produced the most active thunderstorm day so far during the summer. Photos here are from house - top, looking south at 5:29 pm MST and below at very bottom, looking north at 5:45 pm. The composite radar chart above is from 4:20 pm and shows numerous heavy thunderstorm cells. The storms (as indicated by a number of radar loops) were slowly propagating in a wide variety of directions, building into most unstable, nearby air. Thus, there were a number of heavy rainfalls reported. The surface observations below from TUS show several gust front passages and a wet microburst (or downburst) that produced gusts to 64 mph (also reported were poles down just to the northwest of the NWS observation station). The time series of T and Td from Atmo (second below) seems to indicate three distinct outflows moved across the campus - Atmo had just over 0.40" of rain, while the airport measured over an inch during a very short period, with a storm total of 1.36". The plot of CG flashes for 24-hours ending at 11:00 pm MST last night (above from Vaisala and Atmo) shows the clusters of heavy storms over parts of metro area, and also indicates the lackadaisical movement of the cores. There were some CGs very close to here and I shut down the electronics for about half an hour. Rainfall mostly stayed south, with only 0.08" during the thunderstorm and then a period of debris cloud rain after dark produced another 0.10" - there was just enough rain yesterday at house to keep this from being driest ever July since I began the records here. Plot for the Metro-west sector of the ALERT network below illustrates the hit-and-miss nature of the storms. Across the entire network only 9 stations did not measure rainfall, making yesterday very high POPs day. There were several isolated thunderstorms in southeastern Arizona yesterday afternoon as per detected CG flashes above through 1:00 am MST this morning (from Vaisala and Atmo). Thunderstorm activity increased more markedly across northern Mexico - thus, a bit of an uptick from preceding day. 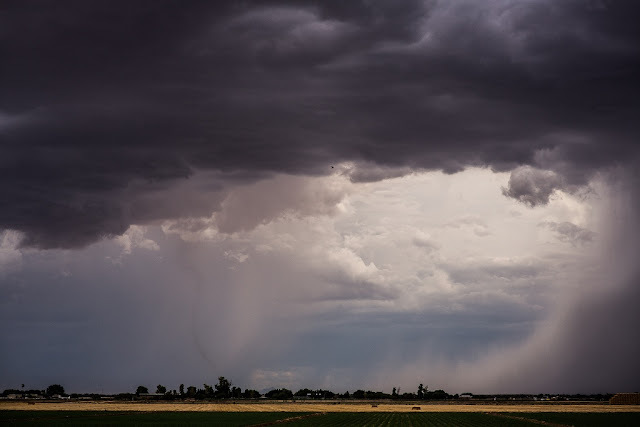 There was one report of 0.04" of rain across all of the Pima County ALERT network and basically the break in summer storm activity this side of border continued for yet another day. The larger-scale pattern this morning continues to be ill-defined and has some pro indications for increased storm activity, but also carries considerable cons with it. The water vapor image below is from 6:30 am this morning. The most distinct circulation feature in the upper-troposphere is a cyclonic circulation centered just west of Baja at about 25 N. There is a skinny snake of dry air air along the east side of this circulation. The circulation appears to be moving westward, or even a bit west-southwestward this morning. Over Texas a broad, diffuse, inverted trough continues in the upper-levels. The most distinct circulation center embedded in the broad trough appears (via loops) to be centered south of the Big Bend. The latest NAM forecasts weaken this feature and move it west-southwestward. The skewT plot above is from SPC for the 12 UTC data from TWC. Pros - PW is up and over 1.60 inches; CAPE is moderate and considerably up from recent days. Cons - Indistinct steering flow this morning due to L/V winds from 500 to 300 mb; upper-level flow is from south, which is quite negative since anvils spread ahead ahead of storm cores and stabilize the low-levels. SkewT below is the same plot but for PHX upper-air data. Conditions at Phoenix are much different than those here at Tucson. Pros - none that I see (note that PW is considerably lower due to the dry air just above the surface). Cons - No CAPE, plus all those listed for Tucson. Last evening there were only forecast runs for the WRF-NAM at Atmo, with the GFS versions missing. The 06z forecasts from WRF are forecasting a big storm day (at least in comparison to past past week or so) for eastern Pima County. The forecast sounding above is for TWC at 2:00 pm MST - the CAPE is indicated to be over 1600 J/Kg (appears to be considerably too high for the mixed layer conditions), even though PW is down some (~1.50 inches) due to the northwest winds in the BL. The model forecasts a much more organized southerly flow to be in place above the BL this afternoon - but will this actually happen? The new NAM forecast seems to indicate continued L/V middle-level winds this afternoon. The model forecasts storms to move fairly quickly toward the north; however, if the steering flow remains weak, storms will hug the higher elevations and only come off if there are organized outflows. There should definitely be an increase in thunderstorm activity today, but many locales will probably be "anviled out" due to the southerly winds at upper-levels. The two forecasts below are from the 06Z WRF-NAM. The first is of composite radar echoes valid at 4:00 pm this afternoon and the bottom is for accumulated rainfall though midnight tonight. The 00 UTC version of the WRF-NAM forecasts kept most thunderstorms south of the Tucson metro area from southeast to southwest, and with much less rainfall. All-in-all, a very difficult day for precise forecasting. Yesterday was almost totally suppressed and quiet north of the border, except for the far southeast corner of Cochise County. Northern Mexico was also very much down, after stabilizing impacts of the MCSs on Saturday night - Mike Hardiman mentioned this in his comment yesterday. This morning we continue to be under the cloudiness wrapped around the west side of the 500 mb anticyclone, even though the center of that feature has shifted far to east this morning and is now over Arkansas. There are two features of interest within the easterly flow on south side of anticyclone - a weak cyclone is located over southern end of Baja and a large, somewhat diffuse, inverted trough is over east Texas. The inverted trough is forecast to move slowly in our direction, while the feature over southern Baja shifts northward and mostly westward. The TWC morning sounding (skewT for 12 UTC data below from SPC) is considerably more moist this morning with PW up by almost 4/10s of an inch and surface dewpoints at airport up more than 10 F from 24-hours ago. But, even with this moistening, I estimate only a sliver of CAPE for low-elevations this afternoon, although mountains should be more unstable. The troposphere overhead seems devoid of any meaningful, organized wind field - a really miserable situation that continues into our new week. Forecasts from the various Atmo WRF runs overnight indicate only isolated showers and thunderstorms along the border and some of the higher elevations of southeastern Arizona today. Things will likely pick up by mid-week as the feature from Texas approaches. First, a review of yesterday afternoon. 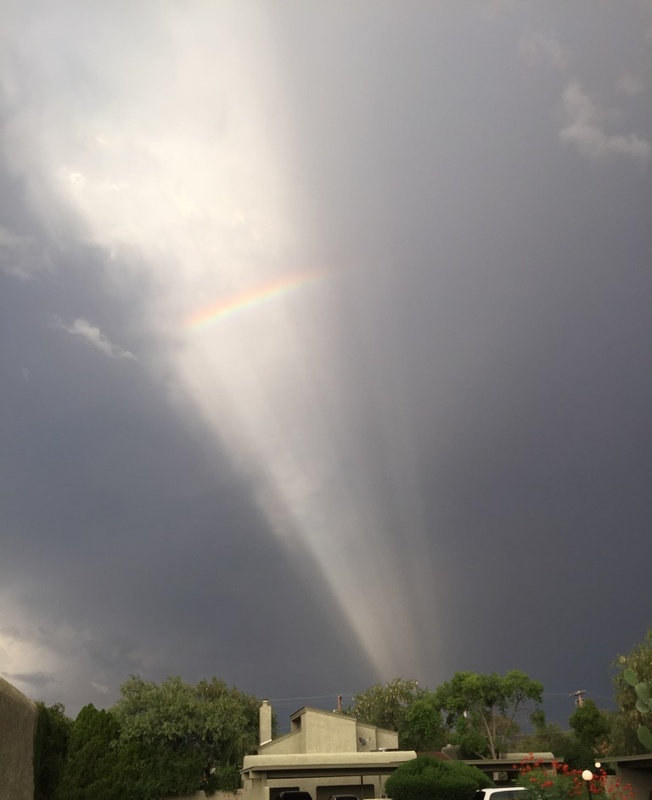 There were several thunderstorms over far southeastern Cochise County yesterday evening. Plot of detected CG flashes above (from Vaisala and Atmo) is for 24-hours ending at 6:00 am MST this morning. There was a substantial increase in thunderstorm activity over northern Mexico during past 12-18 hours. 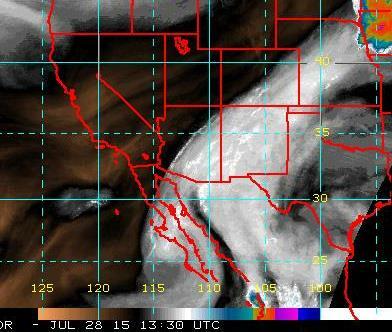 The 09 UTC IR image below shows a large MCS over northeastern Sonora, with a new MCS developing to its southwest. the second MCS is now active over southern Sonora. Outflows from the decayed, nearer MCS may be helping keep low level dewpoints south and east of Tucson in the 60s F this morning; however, high elevation RAWS stations indicate that dry air aloft continues, except perhaps right along the southeastern Borderlands. The WRF models forecast storm activity to continue today mostly in northern Mexico, with perhaps some light, middle-level sprinkles over southeastern Arizona. Plot above shows the 12 UTC skewT plot (from SPC) for the NWS TWC upper-air data.. Low-levels continue very dry, with no CAPE. There is a layer of seriously bad data aloft from about 650 to 550 mb, where the lapse rate is strongly super-adiabatic. Middle and upper-level moisture continues as debris cloudiness and moisture advects northward around the west side of the anticyclone, which is now over far eastern New Mexico. The sounding data should not have been transmitted given that it was obviously bad. It has now gone into several upper-air data bases to perhaps confound future users of the observations. The sounding below from NWS/SRP in Phoenix, presents a better picture of how pathetic conditions in low-levels continue today. Almost a completely down day yesterday, as per the early WRF model forecasts. The plot of detected CG flashes (above, from Vaisala and Atmo for 24-hours ending at midnight last night) shows a few flashes in the east end of Catalinas and also down in the Santa Ritas, with most activity in Cochise County. Across the ALERT network only 4 sites had very light rainfall during past 24-hours, so yesterday and last night were essentially zero POPs periods for almost all of Pima County. There is abundant debris cloudiness from Mexico at middle and high levels across all of southeast Arizona this morning (visible image below from 6:45 am MST). A quick look at this image would lead one to believe that we should be in thick of the action today. However, the 12 UTC sounding from TWC (skewT plot above from NCAR RAL) shows dry air within most of old boundary layer, i.e., up to 700 mb - only moisture is holding on near surface. The morning Phoenix sounding (below for 12 UTC) is even more dismal with very dry air below 700 mb. Note the northwest winds at 10 to 20 mph up at Phoenix, which will be pushing this drier air our way. So, it is not surprising that the model forecasts this morning indicate only isolated thunderstorms in Santa Cruz and Cochise Counties today. While June was interesting, July has proven to be very depressing here in the local area. Showers And Clouds Suppressed Storms Yesterday - Repeat Today? First, a review of yesterday. As is typical, the morning showers put a severe damper on storm development in eastern Pima County for the remainder of the day. The composite radar chart from 5:00 pm MST yesterday afternoon (above) shows weak echo across the entire local region from Nogales to Oracle, with thunderstorms far removed to the east and west of Tucson. Plot of detected CG flashes (from Vaisala and Atmo below, through 11 pm last evening) shows the same pattern, with a large void of thunderstorm activity reflecting the path of the morning showers. Not surprisingly, rainfall did not live up to expectations, given the extremely moist atmosphere. 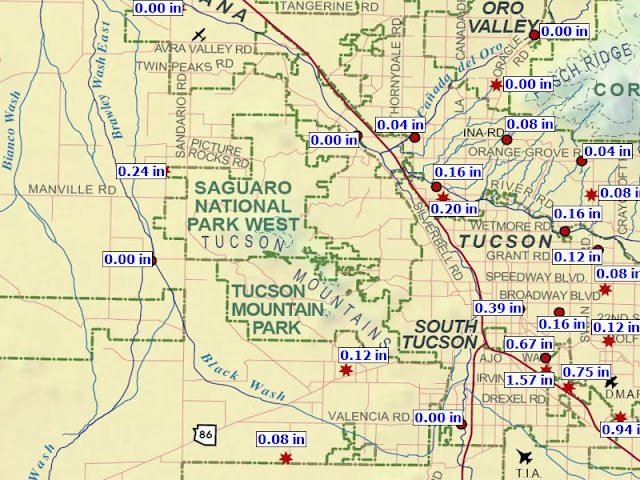 From 10:00 am (after the showers had mostly exited to the northwest) through 5:00 pm only 17 ALERT sites measured rainfall amounts that were very light (exception was 0.59" at Dan Saddle in the Catalinas). Then for the period from 5:00 pm through 5:00 am this morning 31 sites had rainfall from cloud-debris showers moving in from the south. The nighttime amounts were very light, with the heaviest outlier being 0.28" on Redington Pass. Here at the house we had 0.08" from the morning showers and then 0.03" as the evening showers passed by. All-in-all, quite a dismal day for late July. This morning has arrived with some sunshine. The visible satellite image - above for 6:00 am MST - shows a broad swath of cloudiness that extends across all of Sonora, eastern Arizona and into Colorado, but with large breaks over southeastern Arizona. 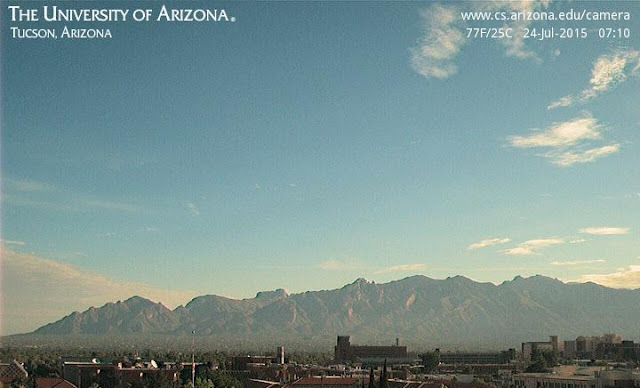 Presently skies are mostly clear over the Catalinas as per campus webcam view below. We can start the day with better hopes than yesterday. This morning's skewT plot of the 12 UTC TWC sounding data (above from SPC) remains quite similar to those of the past couple of mornings - very wet with CAPE available given heating, but with a hostile wind profile for the metro area. The light/variable winds in the lower troposphere now are at 700 mb and below, with light southerly steering winds for thunderstorms. Matt Bunker's PW analysis for the 12 UTC soundings this morning (below - links are available in an earlier post) shows the TWC sounding to be by far the wettest in the Southwest. Possible problems for this afternoon, even with sunshine, include: the heating will build a new boundary layer up to about 750 - 800 mb but this will have some CIN above that would need outflow help at low elevations; upper-level wind profile is quite negative and would again stream anvil clouds from south over the metro area (indeed, several of the WRF forecasts for the afternoon show this happening); and some of the WRF forecasts begin drying out our low-levels from the northwest this afternoon. I have looked at the WRF runs from both 00 and 06 UTC last evening - I can not really find a variant that does not seem to have some problems. Some appear too dry, some too cloudy, some too stable, and etc., so I'll wait for Mike's discussion of the new 12 UTC forecast runs. However, none of the four versions forecast thunderstorms at low elevations of eastern Pima County. The 00 UTC WRF-NAM forecast of composite radar echoes for 4:00 pm this afternoon (below) is as active as it gets in that forecast. Other versions have more storm activity on the mountains right around Tucson. I tend to feel that these early forecasts from WRF are a bit conservative, and that we'll see more thunderstorm activity nearby this afternoon - which is probably a reasonable guess, given yesterday's total lack of nearby thunderstorms.